If you would like to see our available puppies, please click on the yellow button at the right marked “Available Puppies”. To see some of the puppies that we have already placed, be sure to visit my “Past Poms” page as well. Enjoy! Email, call, or text anytime…. 🙂 We hope you enjoy browsing through our site. Hope to hear from you soon! 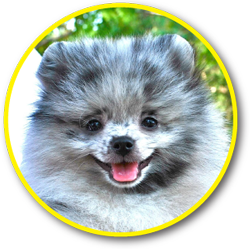 We are a small breeder of beautiful pomeranian puppies near Austin, Texas. We have owned and bred Pomeranians for over twenty years. Our children were all raised with our little fur balls and now our grandchildren are enjoying them as well. We are committed to excellence in quality and temperament and offer a wide range of beautiful and exotic colors. We are licensed by the State of Texas and we are in good standing with the American Kennel Club (AKC) and inspected by both on a regular basis. We have received the Gold Star of Approval from the AKC stating that we have gone above and beyond the requirements set forth by AKC. Our pomeranian puppies are housed within our home and are well socialized and integrated into our family. Our puppies are loved on from birth, and when they are old enough to leave, they will be well socialized and come with the expectation to be loved on and cared for.